There are exceptions, of course, and Osteria Marzia is one. A Black Sheep Restaurants’ concept—and those guys certainly know what they’re doing when it comes to opening noteworthy dining venues—this spot is where you’ll now find me whenever I am hankering for good Italian fare—fish to be precise, since this is the restaurant’s forte. 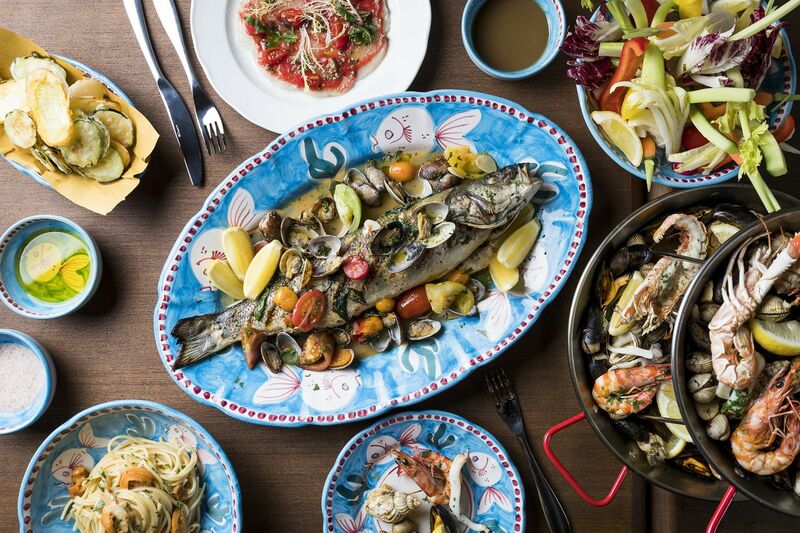 Osteria Marzia pays homage to southern Italy’s coastal culinary traditions—think Sicily, the Amalfi Coast, Puglia and Sardinia—with a small menu that could only be described in one way: proper. That’s not surprising when running the kitchen is Italian chef Luca Marinelli, who trained under esteemed chef Mauro Uliassi and was formerly at Isono and Buenos Aires Polo Club. But before getting to that, it’s the design that might first swoon you over. Conceived by local design firm Substance, a seaside-theme runs throughout the airy dining area, taking patrons to the shores of the boot-shaped country. There are ocean inspired tiles decorating the bar, buoy-like lanterns hanging from the double-height ceiling, dishware from Positano and a moon-like orb towering over the space, wrapped up in a fisherman’s net. The staff are in nautical outfits too, with striped shirts and white trousers, boat shoes and navy blazers. It’s the sort of trattoria 2.0 that falls into the zeitgeist of recent times: trendy, appealing, and expensive in look and feel. Like spaghetti Ricci, which came next: perfectly al dente ribbons of pasta, layered with chunks of creamy A.O.P sea urchin, so moist and buttery they writhed lusciously on the fork. Three more pasta dishes grace the menu, each fish or seafood-based and, from my peeking at my neighbouring tables, each as satisfyingly hefty. This, really, is what Osteria Marzia does best: cooking that stays simple yet feels sophisticated. Service reflects the same attitude: the staff are smiley, affable, prompt but not obtrusive—the kind that makes you feel you are being looked after by someone who cares. And who’s more than knowledgeable about wine—rigorously from Italy’s southern regions—and happy to pour you a glass of Donnafugata Zibibbo from Sicily just so you can try it out. Or a free limoncello at the end of dinner, to pair with a granita of the day (cherry-flavoured, in my case), or the other classic Italian desserts’—giandujia, pannacotta, fruit tart—all rigorously made in-house. Were it not for the super neat settings, Osteria Marzia could easily pass for a family-run space, where the owner knows you by name, the waiter is quick to pour your favourite wine and the chef remembers what you like from the menu. But then again, that’s maybe what family-run looks like in Hong Kong in 2017. I certainly felt at home.